What Franklin couldn’t have known was that a couple of centuries later, in a greatly expanded country, turkeys would still roam the whole of it. Wild turkeys are found in every state except Alaska, and their conservation status is “least concern” — this about a hundred years after we nearly ate them into extinction. Following a restoration effort that took off in the 1950s, the birds number in the millions again: common enough not to be thrilling, yet unusual enough that you’d probably point them out in passing (or have some questions about their behaviors and rituals). 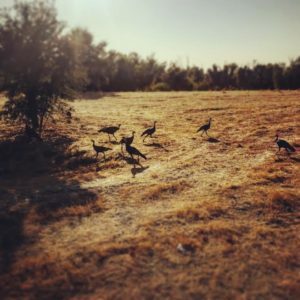 That rebound was achieved in part by capturing wild turkeys and releasing them in new places, including California, where a different turkey ancestor had died out long ago. Because they offer water, along with relative safety from predators and hunters, the suburbs have become common habitats. 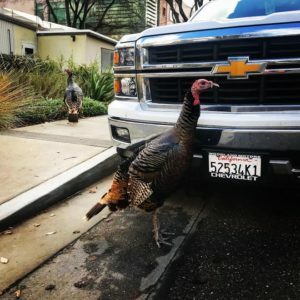 In early 2017, I moved to one such turkey-ridden suburb: Davis, California. It’s a hot, flat college town that lies about 20 minutes outside Sacramento. My girlfriend, Maddie, was getting her master’s degree at UC Davis, and although I loved my back bedroom in a shared house in the absolute armpit of Hollywood, I love her a great deal more. The 400-mile trips to see each other were not a long-term solution. So I gave up big city life — temporarily, at least — for a Central Valley hamlet I knew very little about. But Maddie had, at one point, sent me a local news item that suggested residents were well aware of the boldness Franklin described in turkeys: It seems one in particular was terrorizing the normally quiet downtown, driving people to call 911 in panicked embarrassment. Downtown Tom, as he came to be known (“tom” being the generic name for a male turkey), represented a culmination of his species’ comeback, intimidating and taunting the humans whose ancestors had slaughtered his. And the poetics didn’t stop there. The Davis turkey flock had first turned up around 2006, patrolling a small cemetery a few blocks away from where Maddie and I would later live, bullying mourners who dared to trespass on their property. They spread throughout the city after an old barn — their roosting space — was torn down to make way for a new residential tract, the development in that neighborhood supercharged by a housing shortage. Moving west, toward cultivated farmland, they gained access to the grain, seeds and berries that turkeys thrive on, meanwhile making excellent use of the park meadows and scattered woods. It was almost as if Davis had been engineered for their eventual takeover. By the time I moved there, Davis had been struggling for a decade to manage the birds. Over that period, the wild turkey population grew from six to nearly 100. Most of the containment efforts involve trapping the turkeys and releasing them elsewhere, but Downtown Tom’s aggression led to the approval, in certain cases, of lethal action. As far as I know, he was the only one euthanized so far, though we now and then saw a truck driven by an animal control guy — it had a line of red, turkey-shaped stickers on the tailgate, each representing a bird put down. A maturing business in the region, I’m sure. Personally, though, I liked the turkeys. They didn’t scratch up my car or poop on our patio furniture. It was rare to see them strutting around on the busier, shop-lined streets near campus. When we did come across them on walks, Maddie would mention how alien or dinosaur-like they are, warning me not to get too close. More often I would see them while alone, on a run, hugging the wilder edges of town, foraging by the creek or in grassy clearings not claimed for real estate. Contrary to their reputation, they shied away from any approach, fleeing slowly as a group. In isolation, however, they proved more likely to hold their ground, skeptical of the threat I posed. They could be, as Franklin noted, almost vain, and I found myself wondering if they did not enjoy attention. The turkeys were one of those natural reminders of our uncertain grip on Earth. It was not that they aimed to uproot and destroy us like the birds of Hitchcock’s classic — Downtown Tom had fought and lost that rebellion alone — but they lingered at the periphery, circumscribing the town, ready to move in whenever the pesky and unpredictable primates had gone. Despite a reduction in number, they raised a robust generation of chicks, or poults, that appeared to more than make up the difference. We’ve given them everything they want in a home, and they will not be giving it up. The Davis turkeys are on my mind this week, even though Maddie and I have moved back down to L.A., not just because I and so many others will be eating their kind for Thanksgiving. The air out there, because of the deadly Camp Fire raging to the north, has been toxic with smoke for days, and it’s only now beginning to clear. It’s hardly the first time a wildfire has poisoned the area, either. As we reckon with the challenges of keeping California habitable for ourselves, I come back around to the question of creatures whose fate has hinged on humankind. Will these gobbling gangs survive our self-destruction, finally seizing all that we had promised them? Or do they die with us? Could their near-annihilation and resurgence predict our own current catastrophe? Not even the turkeys know that. But if they become the dominant force on this land mass, presiding over scraggly tribes of H. sapiens, I hope they will understand us better than we have them. They’ve already mastered our crosswalks, anyway. And I’ll just add this: no hard feelings if they don’t put a human on their federal seal.